Betty Mouat's is located near the tip of the South Mainland. 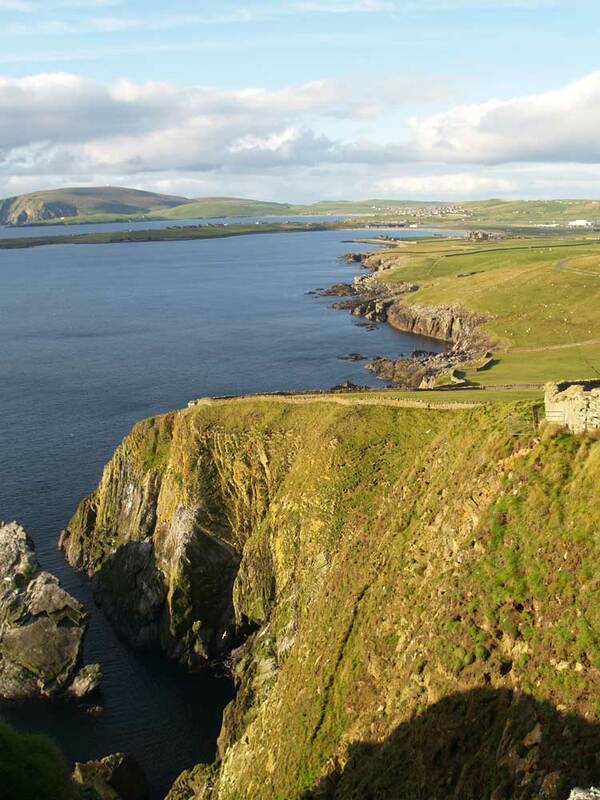 This is a narrow peninsula which runs 25 miles south from Lerwick and boasts some of Shetland's most attractive scenery, an extraordinary concentration of archaeological sites, and world-class wildlife attractions in its seabird cliffs, wildfowl lochs, seal rookeries and whale-watching viewpoints. The modern highway between Lerwick and Sumburgh Airport has many side roads which make this an ideal area to explore by car. There is excellent walking round the coastline and along the ridge of hills which forms the spine of the South Mainland. The views from summits such as Sumburgh Head, Scousburgh Hill and Fitful Head are on an epic scale: crofts and farmland fringe beaches, or ayres, of shell sand and secluded rocky coves, or geos; while to seaward Fair Isle and Foula make romantic silhouettes on the ocean horizon. The shape of the land has mostly been carved by glaciers out of ancient Old Red Sandstone rocks, some 370 million years old, although there are also deposits of soapstone and copper ores. Sandy soil and generations of careful husbandry have made this Shetland's most productive agricultural district. The South Mainland also has the most extensive sand dunes in the islands - sandstorms have helped to preserve archaeological sites such as Jarlshof and Old Scatness. All through the South Mainland you will find fascinating traces of the past: miniature watermills and old croft townships constructed from the area's beautiful building stone; patterns of ancient field systems; Shetland Ponies whose ancestors carried the peats home for winter fuel; and traditional double-ended Shetland boats whose lines speak of their Viking origins. Public Telephones: Quarff Cunningsburgh, Sandwick Levenwick, Bigton, Dunrossness, Toab, Sumburgh Airport and Grutness.